My Dad died yesterday, peacefully, surrounded by some close family. After many years of battling debilitating illness, it was a relief to have a passing so swift and peaceful. Today we met with the funeral director and after a fairly intense planning suggestion, a slightly light-hearted question was asked. Do we have to purchase a brought coffin? And with increasing energy, we began to explore the possibilities of building, then decorating, our own. It would be a group project while we wait for the funeral. It would be an act of love. It would help us process our emotions. It would connect us, personally, with what is happening. It would allow different family groups – some builders, some decorators, some cup of tea makers, to be at work. We each do our little bit. Saturday update: Friday night the plan was made, with a bit of help from the internet. Saturday morning we confirmed the plan and brought the pine. Saturday afternoon we built the base, sides, handles and lid. The grandkids did lots of the drilling, while the adults supervised and guided. A really rich time of participation and learning. Saturday evening update: And now, in the evening, after dinner, a blonde wood stain. It has brought out the pine wood, offered some sense of a proper finish, and laid the foundation for the decorator crew on Sunday. A different group of participants were involved in this painting phase, folk who felt they could contribute via paint, more than hammer and drill. Sunday evening: With the coffin built, today became a day of decoration. Each person found a spot around the sides – a panel for each family. Some used words, others song lyrics, others stencils, beads or lolly wrappers. Across the generations words of love and memory were inscribed. The coffin is now individualised, made with love, decorated with care. The lid has been kept free and before the funeral, participants will be invited to add their words of memory. It has been a rich, full weekend. The activity has created memories and given us something to storytell together, as we seek to find new ways to relate and connect as a family. Monday morning: So the funeral director returned to take away the coffin. She seemed genuinely impressed, moved by the heartfelt decorations on the side and the extensive number of screws used to hold down the lid. It felt good to help her load the coffin into the hearse. And then to close the boot and realise that I’d personally been able to be part of making what would carry Dad for his final physical journey, first to the church tomorrow and finally into cremation. Tuesday at the funeral: As hoped, a handmade coffin, already decorated, proved a big of a magnet. The service was from 3:30pm, with refreshments and fellowship from 2 pm. This included the invitation for folk to sign the coffin and/or leave a message. It was wonderful seeing folk gathered around the coffin, reading, talking, interacting, messaging. It allowed another layer of storytelling and helped people connect with the reality of Dad’s death. We made a backup plan. If we’re not successful by Monday, we can go back to the catalogue. Which gives us two days to see what we can produce. Last night was one of the most rich speaking engagements I’ve ever been part of. Last year I spoke to the Churches of Christ ministers at their annual Magarey lecture. I focused on the importance of our sense in the mission of God. A number of those present wanted to continue the conversation and the result was an invite to last night – to be part of Conversations at the table. But as a feast rather than a talkfest! I arrived to find a four course dinner, lights dimmed, candles lit, flowers laid out around tables. It was extraordinary. 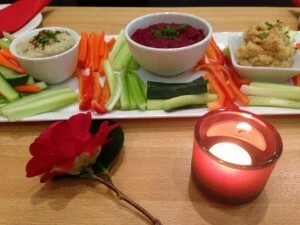 Between each course I engaged a Scriptural text and explored four themes – companions, manners, words and communion. 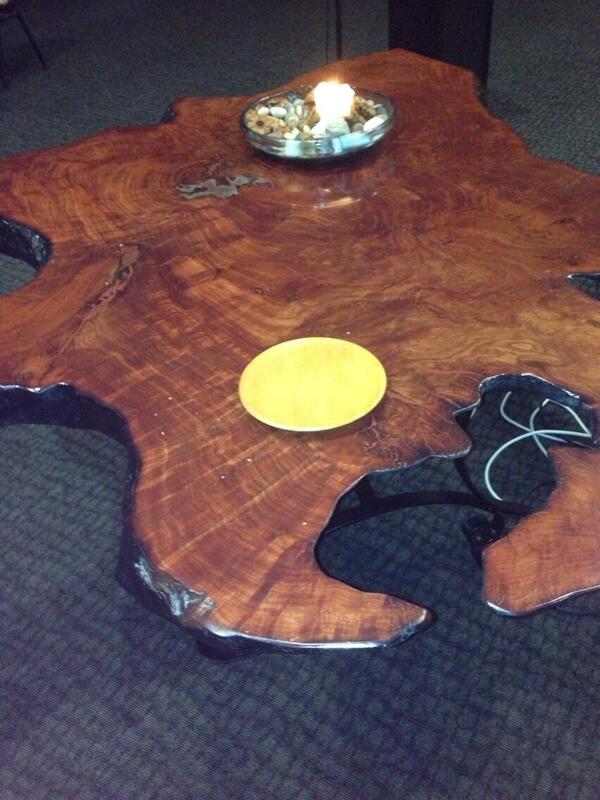 I wanted to provide examples of how to do church around tables, not to try and be fresh or relevant or cool. Rather in response to Jesus, who did so much of his ministry in conversation at tables. I began my inviting them to plan a special meal for 4-6 people. Who would you invite? Where would you have it? What would you eat? What would you celebrate? I then read the Parable of the Great Banquet, in Luke 14:15-23 and asked if anyone had stories of times when you’ve invited “poor, crippled, blind, lame.” This opened up some great conversation, about how we’re changed by the simple acts of inviting the strangers to eat. I introduced them to John Koenig and his research into churches and food. And the four hospitality practices he offers. Practice: serving graciously by finding ways to encourage eye contact and genuine conversation. Practice: setting tables in ways and places that reflect God’s abundance and creativity. Practice: committing to a long-term, intentional project. I asked if Christians should eat differently and suggested a number of practices that might mark Kingdom manners. This included placing on the table all the cans (cleaned) used to make the meal we were enjoying and inviting folk to talk about the labels, what we know of the prayer needs of that country and pray for those people. Intercession! I used the movie The Kings Speech, to ask what it means for us to find voice, to share our story as part of conversations. It was spliced with a number of video and art explorations of woman at the Well in John 4 – her sharing her story uniquely. We finished with communion. It allowed us to draw the evening together – to “Do this in memory of” the table fellowship of Jesus, the manners of the Kingdom, the words. I finished with one final conversation around table, the Emmaus story in Luke 24, to remind us that the cup is the cup of the new covenant, in which Jesus continues to be recognised around tables; not just in the past, but into the future. Why such a rich night? The multiple senses – food, lighting, environment, conversation, cans, wrapped around justice, mission and hospitality – made for an evening that was rich, yet inputting. The people at tables were from diverse churches, making it a time of relational growing. Mission was made as simple as eating, as challenging as Jesus radical Kingdom manners. A night I will remember for a long time. 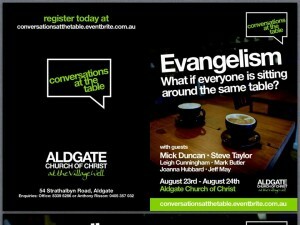 And I’d love to do this with other groups – an evening of mission as conversation at tables. I’m speaking today at Conversations at the table. It’s a unique invite. They want me to talk actually at tables, around food, between courses. Not as the make them laugh after dinner speaker, but to engage their senses in God’s mission of justice, community building and story telling. I’ll be taking along John Koenig, Soul Banquets: How Meals Become Mission in the Local Congregation . And a range of practical exercises shaped for me by Sense Making Faith. And some video clips – from Ratatouille and The Kings Speech. And some art. 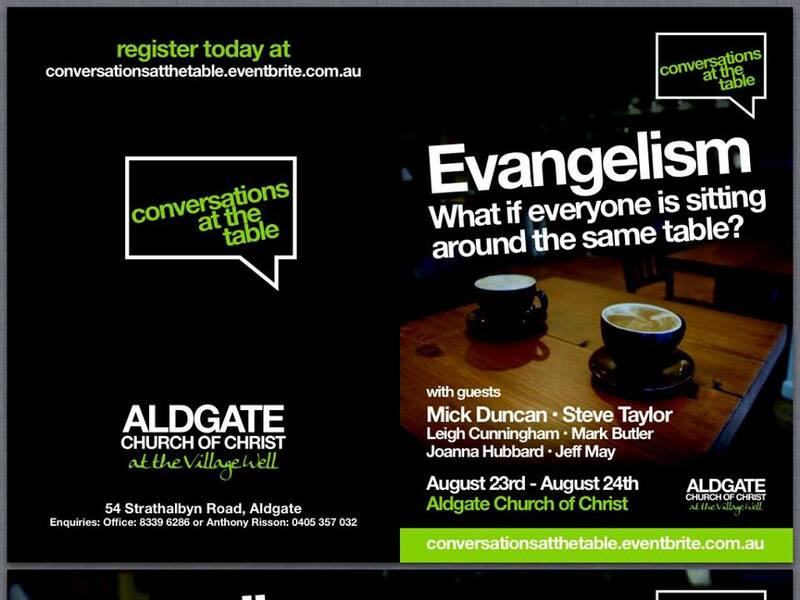 And some table mats, to get them thinking about what church would look like if it was conversations at tables. And praying – that between mouthfuls, God speaks. I’m teaching an introduction to Christian theology topic this Semester. I began with a two questions and a proposal. First question, does anyone here not have access to a computer? All did. Second question, does anyone here not have access to a printer? All did. Which led to the proposal. I will put all the lecture notes and class readings online. And when we meet, rather then talk theology ie me lecture you, we will do theology ie I will guide you, through the readings and my doing theology together. We were all a bit apprehensive about this new approach, since the dominant model of education involves an expert imparting knowledge. But I was keen to explore a learning by doing, induction process, which better equipped them for the complexity of life beyond the classroom. To help guide them, I have outlined to them the following process, which they used to get them going. I’m curious about this because …. My conversation partners will need to include …. The values I have used to chose them include (from week three) …. So far, after four weeks, we are all greatly energised. They have come up with excellent theological questions – none that we would have discussed in a normal syllabus, yet all touching key theological themes. They loved the conversation partner idea. The process really energised the library visit I then organised, when they got shown how to use databases to find conversation partners. Some were heading back to the library after class to search further. I preached in chapel today. The Gospel lectionary text was Luke 13:10-17. After the reading, I played Van Gogh Shadows by Luka Agnani and then spoke. The video brings together two artists. First, Vincent Van Gogh. Our entire trip through Europe during our Sabbatical was defined by Van Gogh. Our 13 year old was fascinated by the colours, the vibrancy, the subject matter, the fact he cut off his ear. The second artist is Luka Agnani. A digital artist. Who takes Van Gogh – 13 paintings – and adds light, intensity, movement and people. The result is that what is historic, Van Gogh paintings, is seen in fresh ways. Things we’d not noticed. People I’d not paid attention to. Insights I’d not been aware of. Which also helps me make sense of some of my current research. I’m exploring new ways of church. How does what is historic, relate to the new, the contemporary world around us? As part of the research, I’ve been re-reading the Basis of Union. As all Principals of Uniting Colleges do! In particular wonderful phrase “fresh words and deeds.” It occurs at the end of Paragraph 11. According to Davis McCaughey’s Commentary on the Basis of Union, you need to read paragraph 11, alongside paragraph 10. It’s such an interesting place to locate scholars- not in paragraph 10, with the historic, but in paragraph 11, with contemporary societies and fresh words and deeds. So applying Paragraph 10 – we need historic maps – we need Van Gogh – we need the Old Testament, the Torah, the Law. And applying Paragraph 11 – we need scholarly interpreters, who help us stand in relation to contemporary society. Result is fresh words and deeds – fresh light, extra intensity, focus on people. Which I hope is our experience – as faculty, as students – at Uniting College, as Flinders Department of Theology, as Adelaide College of Divinity. We’re hold Paragraph 10 and 11 together. The historic – Scripture, tradition – and the new – reading the culture in mission. And the result? May the Lord be confessed in fresh words and deeds. Words like sin and evil don’t always play well in a liberal world. In a world of tolerance, we like to assume the best of another. In a strength based paradigm, we like to focus on the positives of appreciative inquiry, as in this wonderful video. I remember a class, in which I was told in no uncertain terms by a minsterial candidate that they didn’t believe in sin. It was an old-fashioned invention of the church, designed to encourage guilt in religion. It is a conversation that has continued to sit with me. What is the place of sin and evil in a contemporary, liberal world? Evil may be a medieval theological concept, but when it invades your interface with the rest of humanity – and confronts your unwilling mind with imagery designed to provoke disgust, fear and self-loathing – it is all too modern. It reminded me of the conclusion by Miroslav Volf, Exclusion & Embrace: A Theological Exploration of Identity, Otherness, and Reconciliation . He argues for a God of justice. To the person who is inclined to dismiss it, I suggest imagining that you are delivering a lecture in a warzone. Among your listeners are people whose cities and villages have been first plundered, then burned and leveled to the ground, whose daughters have been raped, whose fathers and brothers have had their throats slit. The topic of the lecture: a Christian attitude toward nonviolence. The thesis: we should not retaliate since God is perfect noncoercive love. Soon you will discover that it takes the quiet of a suburban home for the birth of the thesis that human nonviolence corresponds to God’s refusal to judge. In a scorched land, soaked in the blood of the innocent, it will invariably die. And as one watches it die, one will do well to reflect about many other pleasant captivities of the liberal mind. (Exclusion & Embrace: A Theological Exploration of Identity, Otherness, and Reconciliation , p.304). There is much, much, more to Volf. But it is a reminder that theology needs to take sin and evil seriously. A worthy topic for my Introduction to Theology class tomorrow perhaps. Today, I took a second step with the Master of Ministry Theology of Ministry Practice class. The assumption of the topic is that each participant began ministry with a theology of ministry, a set of values and principles about ministry. Another assumption is that over time, they have collected experiences. Now, as they begin their Master of Ministry journey, is a time to re-theologise, to think again about their theology of ministry practice, to contemporise their reading, to clarify what their thesis topic really should be. For this second class, each participant was invited to bring an experience, a moment of ministry that had left them thinking. We began the class by sharing, around the room and online, using video-conferencing software. A rich set of stories, confronting, challenging, emerged. It was time for the second step. Having shared, I invited them to consider themselves hosts of a dinner party. And to choose six guests whom they would like to have help them think through the question raised by the ministry experience. They could be alive or dead. But who would they like to have a conversation with. I also noted that the average person speaks at about 100 words a minute. So one hour conversation with these six guests, would in fact be 6,000 words – the size of their essay. And like all conversations, these guests would probably argue ie engage in critical thinking. Well, the lights went on and the energy went up in the room. Theology had been transformed. The participants had all sorts of interesting people they wanted to invite to their theological dinner party for conversation. People from the story they had shared, artists who would help them think differently, theologians in history, ministry practitioners they admired, saints who embody practices they value. Which raised the inevitable question. How to get these voices into a theology essay? How to research and quote and cite? Well, I said, that’s the third step. That’s for next gathering. How about I invite the librarian next time we meet and we ask them? We get them to guide us to the relevant databases, help us work out how to source information, whether books or journals or newspapers or people. Lots of nods around the table. Lots of interest now in literature searching and proper use of bibliographies. Because research has taken another whole different shape. It’s a dinner party conversation. Tonight is an Adelaide reunion of mission-shaped ministry course participants. We’re bringing together folk from the 2011 (45 participants meeting at Burnside Uniting) and 2012 (15 participants meeting at City Soul) courses. For reasons of community and coaching. Regarding community, they’ve not met each other, yet both been through the same experiences. They’ve both experienced ecumenism, hospitality, community, interaction and input around fresh expressions, pioneering and mission-shaped ministry. So it will be fascinating to see what happens as people that are strangers, yet share a similar experience, and hopefully passion, mingle. Regarding coaching, we’re also hoping to get some energy moving around the what next of coaching in community. The mission-shaped ministry course is not about information transfer, but about the invitation to participate in mission. So, since they were commissioned, since they left with a range of hopes and dreams, what has happened. We’re hiring – a very exciting movement for us here at Uniting College. Blended education is important for three reasons. First, access. It allows folk who can’t make face to face at set times to still be able to learn and participate. Second community. It allows more ways to engage and connect. It gives introverts time to think, it allows conversations to go deeper and spiral over time. Third, inter-connection. Image learning not only with face to face classmates, but with people across Australia. And the opposite. Imagine being in Ceduna or Townsville, yet able to engage with others both in a face to face class and at distance. It is this vision, for a richer, deeper, more accessible education and formation, that is encouraging us. Uniting College for Leadership & Theology is seeking a person to provide leadership in the embedding of blended learning as a key mode of delivery. This will include resourcing, developing and supporting both faculty and students in the transition to fully blended theological and ministry education at both VET and Higher Education levels. An expertise in relevant technologies, including Moodle, websearching and video conferencing will be essential. Applications must be received by the close of business on September 30, 2013 with desired commencement as soon as convenient. Each month I publish a film review, for Touchstone (the New Zealand Methodist magazine). Stretching back to 2005, some 80 plus films later, here is the review for July, of Lone Ranger. I confess to a sheltered childhood. Somehow a masked man and his cry of “Hi-Ho, Silver! Away!” passed me by. Which is strange, given that the Lone Ranger occupies a significant place in contemporary popular culture, including 18 novels, 2,956 radio episodes and 221 half-hour television episodes. Come 2013, the Disney remake of “The Lone Ranger” is able to draw on an extensive cultural arsenal. But this is the 21st century. Thus the way we tell stories of cowboys and Indians is certainly open to a re-make. Much of this film deals with stereotype. It begins with a child wandering a theme park. It is a clever plot device, inviting us to cross times and cultures through the eyes of a child. As we do, we encounter a Western side show, read a sign that says “noble savage,” and find ourselves startled by the appearance of an elderly Tonto (Johnny Depp), with a story to share with us. The Lone Ranger (Armie Hammer as John Reid) is also battling with stereotype. He is a young city lawyer returning to the wild West. He is living in the shadow of his older brother (James Badge Dale as Dan Reid), a real Ranger living on the dry and dusty borders between railroad expansion and Comanche lands. In storytelling one way to deal with stereotype is through character development. Take for instance the character of Tonto. He is introduced as Indian, imprisoned both in sideshow and in a railway carriage with convicted outlaw Butch Cassidy (William Fichtner). Rapidly he becomes mystical saviour, escaping prison, then restoring an injured Lone Ranger from a Butch Cassidy ambush in which his older brother is tortured and killed. As the plot twists, Tonto becomes village idiot, damaged as a child by the greed of Western imperialism. All the time, the cultural gap is immense. In the original 1903‘s radio play, the character of Tonto was introduced so the Lone Ranger would have someone to talk. By 2013, Tonto is a window into a very different world. In Comanche culture, knowledge is treasure, exchange is mutual, while communication is primarily symbolic. In wild Western culture, knowledge is commodified, exchange is earned through gun and greed, while communication is primarily verbal. Except that Tonto is Johnny Deep. Which cleverly makes obvious yet another stereotype, that of the audience. When we see Johnny Deep, we might be a child, but we are still expecting Captain Jack Sparrow, lawless buffoon from the Pirates of the Caribbean series. Who are we really seeing? What is the real story? All of which invites us to consider a final stereotype. The credits of Hollywood roll. And all the time Tonto walks. Away from the sideshow and into his land. Home for Comanche? Or empty desert, waiting to be colonised with greed by gun? One picture. Can it include two peoples. Or must cowboys always end up killing Indians? Today, a first sign of life. A check of the vegetable garden and the peas are up. I love growing peas. They emerge so strong and vigorous. As I stood by the garden, it seemed deeply spiritual. I’d almost forgotten these fragile green signs of life. The last few weeks have been intensely demanding. But that’s the way with seeds. There’s a spirituality that allows you to be other absorbed, be distracted, concentrate elsewhere. And all the time, things are germinating, softening, beginning to sprout. A few months ago I did this at work. I planted some seeds. A lunch meeting, an email, a request for a conversation, a letter suggesting a possibility. This week they sprouted. Still not strong enough to say more. But visible. A spirituality of planting. Plant ahead and wait, trustingly, hopefully, gratefully. Digital artist, Luca Agnani, takes Van Gogh’s paintings and brings them to digital life. He uses a mix of digital light and shadowing plus 3-d mapping, to provide a whole new way of viewing life. It reminds me that life is dynamic rather than static. It is easy to think of life, of faith, of theology, of Scripture, as a snapshot, a moment frozen in time. The reality is that life is always about movement – the child running to the father, the sea a fluid wave movement, the streets full of people on the move. Tomorrow, I am introducing a change to the candidate formation process at Uniting College. We will begin an exploration of practices, framed around a missional spirituality, and enhanced by storytelling – “the stories that you swap with other travellers” – about how these practices take shape in our lives. So we’ve spent a lot of time as a team thinking about why we might do this. Ministry formation could never prepare me for every situation I would find in life. Nor should it. Life is simply too fluid, too dynamic, to evolving, to ever make that possible. Christian faith is dynamic – the practice of being sent, of prayer, of unforced rythyms of grace – are never static, but are always moving, shaped by those who walk toward us and away from us, those we welcome and those we let go, our experiences as we approach Scripture. Practices are our friends in this dynamic of life.